Merry Christmas! I hope you've all had a fantastic time celebrating and eating lots of delicious food. I had an amazing double bill of festivities with Christmas Day spent at my fiancé's parents house and Boxing Day spent at mine. Both days were packed full of presents, chocolates and hilarious games. Big favourites were the Christmas Smells Quiz from Instant Quizzes, What Do You Meme? and winning both the 2017 and Christmas Quiz. 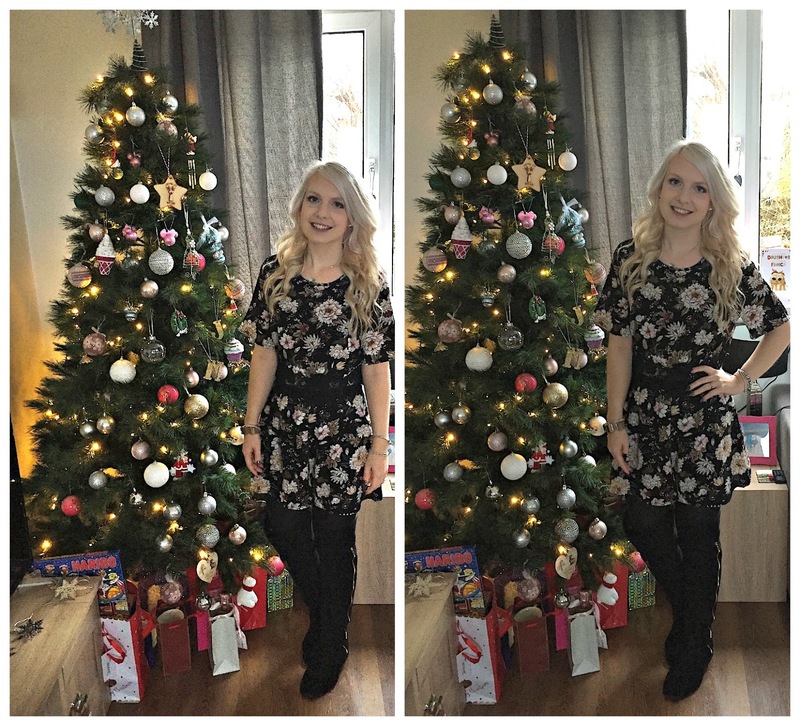 I took a few outfit posts next to our Christmas tree before heading out. Where am I going to take outfit pictures once the decorations go back to the loft for another year!? In the past we've worn Christmas jumpers or dresses on Christmas Day but this year there was just a 'something Christmas' rule so I went for tiny little Christmas pudding earrings so that I could wear the most comfortable playsuit I own. This black floral playsuit with crochet waist is from New Look. It's available in Tall and Petite and both are in the Boxing Day sales. I wore it with my over the knee boots from Primark which were good for keeping me warm on the walk home at the end of the night. New Look have similar boots and I'm tempted to buy a pair with a heel for nights out because I really like this style. Any recommendations of places that do good heeled over the knee boots? 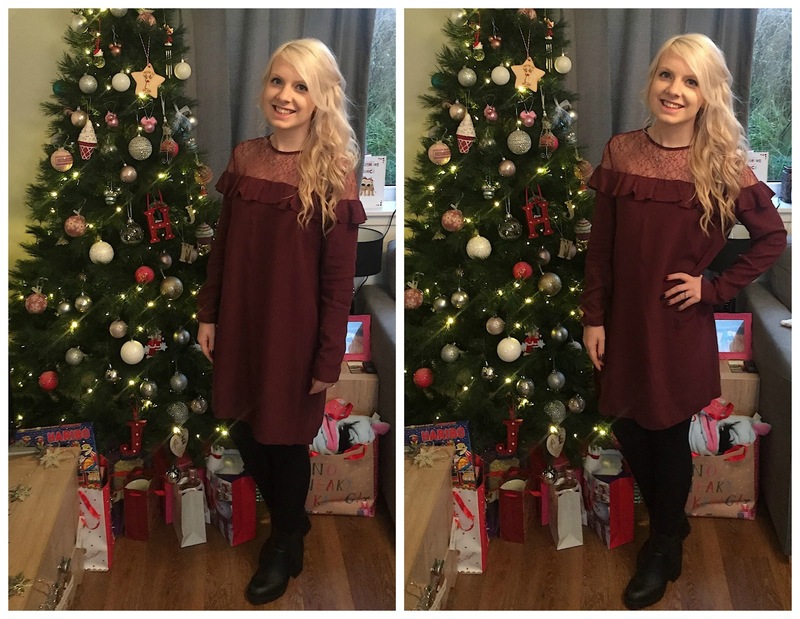 On Boxing Day I was really excited to finally wear this Burgundy lace panel dress. I bought this from New Look in the January sales at the beginning of the year for just £3 down from £24.99! It was a little snug at the time and then forgot all about it once the Spring rolled round and I was a size down. Obviously because it's nearly a year old you can't buy it anymore but they've got a few similar ones; one with bell sleeves, with frills or from the maternity range. I wore it with some black chunky heeled boots, again from New Look. The only annoying thing about this dress is how creased it looked so quickly. It's just one of those materials. It was lovely a comfortable, especially after prawns, turkey and all the trimmings and a big slice of Maltesers and Cadbury's Nibbles cheesecake.